Police responded to the Empire State Building in New York after several people were shot Friday. Read the full story and developments in the investigation on CNN.com. For local coverage, visit WPIX, WCBS and NY1. Scroll down to catch up on the events as they unfolded. [Updated at 3:19 p.m. ET] Two patients who were brought to New York-Presbyterian Hospital Friday have been discharged and one has been admitted, the hospital's public affairs office said in a statement. The three people were brought to New York-Presbyterian Hospital/Weill Cornell Medical Center Emergency Department as a result of a shooting outside the Empire State building shortly after 9 a.m., the hospital said. Other victims were brought to Bellevue Hospital after the shooting, which police said left eight wounded and two dead, including the gunman. Police initially said nine bystanders were wounded in an exchange of gunfire between shooter Jeffrey Johnson and police. That number was later revised to eight. Police killed Johnson as he pulled a gun on them while trying to flee the scene where he fatally shot a former coworker, Police Commissioner Ray Kelly said. The gunman apparently had a longstanding dispute with the victim over workplace harassment allegations, police said. Both men had filed prior complaints. [Updated at 12:16 a.m. ET] New York Mayor Michael Bloomberg praised police and civilians for their quick response to a shooting outside the Empire State Building on Friday morning, which left two dead and nine injured. "There is no doubt that the situation would've been even more tragic except for the extraordinary acts of heroism," Bloomberg said in a media conference. "New York City is the safest big city in this country but we are not immune to the national problem of gun violence." Gunman Jeffrey Johnson, 53, killed one person before he was shot to death outside the busy tourist destination on 34th Street and Fifth Avenue in a chaotic scene just after 9 a.m., Police Commissioner Ray Kelly said. In addition to being home to a popular tourist destination in Midtown Manhattan, the area is also a busy commercial district. "I saw people running and I didn't know what happened. I thought it was a celebrity spotting," said witness Rebecca Fox, who was on her way to work when the shootings broke out. "It was a very surreal scene." The victim was Johnson's former coworker at Hazan Imports, where Johnson was a designer of women's accessories until being laid off last year. As Johnson attempted to flee the scene, a construction worker across the street alerted two police officers, who pursued him up West 33rd Street, Kelly said. As Johnson pulled out a .45 caliber pistol, the officers opened fire, killing Johnson. It was unclear if Johnson managed to shoot a round. Nine others were wounded or grazed in the exchange of gunfire, Kelly said. They were taken to local hospitals where they are expected to recover. "Some may have been accidentally shot by police officers," Kelly said. Photos and messages from Twitter and other digital platforms that appear to be related to the shooting outside the Empire State Building are being collected by CNN.com social media producer Dorrine Mendoza on this Storify page. CNN editors are working to verify this information and will be updating throughout the day. [Updated at 11:26 a.m. ET] A gunman fatally shot a former coworker in the head outside the Empire State Building Friday morning before he was killed by police officers, New York Police Commissioner Ray Kelly said. The suspect, 53-year-old Jeffrey Johnson, was a "disgruntled former employee" of a business near the Empire State Building, Kelly said. As he tried to flee the scene, a construction worker alerted two police officers, who pursued him down 33rd Street, Kelly said. Johnson pulled a .45 caliber gun on the approaching police officers but it not clear if he actually shot any rounds as police opened fire on him, Kelly said. Nine people were wounded or grazed in the crossfire, Kelly said. [Updated at 11:08 a.m. ET] The Empire State Building is fully operational after ten people were shot outside the popular tourist destination this morning, leaving at least two dead. Building representatives released a statement saying the New York Police Department is concluding its investigation that occurred shortly after 9 a.m.
[Updated at 11:08 a.m. ET] New York Mayor Michael Bloomberg is expected to speak soon after a shooting outside the Empire State Building Friday morning left at least two dead, including the suspected gunman. A witnessed said they saw a shooter with a "large gun"
[Updated at 10:40 a.m. ET] New York Mayor Michael Bloomberg is expected to speak at 11 a.m. after a shooting outside the Empire State Building Friday morning left at least two dead, including the suspected gunman. Watch the news conference live on CNN TV, on CNN.com or on your CNN mobile app. • There is no apparent link to terrorism, a law enforcement official said. • Police shot the suspect, whose body is still lying outside the building covered in a sheet, witnesses said. • A woman was also killed in the shooting, which occurred as people were lining up to gain entry to the busy tourist destination on 34 Street and Fifth Avenue. • An elevator worker from inside the Empire State Building ran outside and began chasing the alleged shooter, CNN producer Rose Arce said. At some point police, who were apparently inside the building, were alerted and chased and the alleged shooter. • Photos and messages from Twitter and other digital platforms that appear to be related to the shooting outside the Empire State Building are being collected by CNN.com social media producer Dorrine Mendoza on this Storify page. CNN editors are working to verify this information and will be updating throughout the day. [Updated at 10:33 a.m. ET] The body of the alleged shooter is lying outside the entrance to the Empire State Building after a shooting broke out Friday morning, leaving at least two dead, New York City officials said. A woman was also killed in the shooting, which occurred as people were lining up to gain entry to the busy tourist destination. An elevator worker from inside the Empire State Building ran outside and began chasing the alleged shooter, CNN producer Rose Arce said. At some point police, who were apparently inside the building, were alerted and chased and the alleged shooter. Arce talked to several international tourists who were standing around. "They were completely stunned by what happened and were screaming," Arce reports. [Updated at 10:17 a.m. ET] Ten people were shot outside the Empire State Building, leaving two dead, including the gunman, New York City officials said. A witness told CNN she saw a man lying in the middle of the street surrounded by police. "I saw blood on the sidewalk," Rebecca Fox said. "It was a very surreal scene." [Updated at 10:09 a.m. ET] A suspect started shooting outside the Empire State Building this morning, killing at least one person, New York city officials say. The suspect had a "large gun," a witness told CNN. [Updated at 9:55 a.m. ET] - At least 10 people were shot Friday in front of the Empire State Building in New York Friday morning, the New York Office of Emergency Management said. A suspect in the shooting was shot and killed by police, New York police said. Authorities converged on the building around 9 a.m. after reports of gunfire. A witness told CNN's Rose Arce that the gunman ran after and shot a man in the head. An unarmed guard chased the gunman away, the witness told Arce. 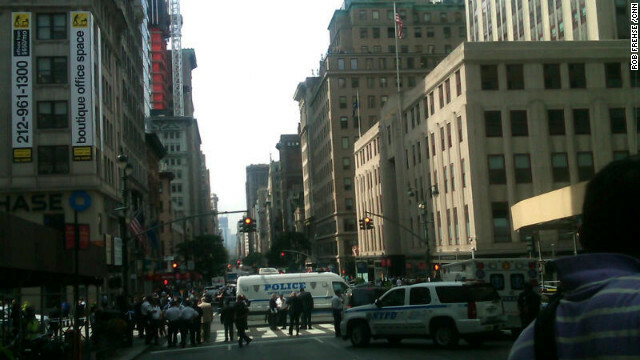 Police have closed several several streets around 5th Avenue and 34th Street in Manhattan. New York resident Max Kaplan, 22, said he heard at least nine gunshots. He said several ambulances have arrived at the scene. "We're all very shaken up at the office," he said. The Empire State Building is one of the most famous skyscrapers in the world, and one of New York City's best-known tourist attractions. Each year, about 4 million people visit the building's two observation decks. At more than 1,453 feet tall, the landmark building reaches more than a quarter-mile into the sky. I watched CNN this morning as they had an "arms expert" and lively discorse about a shotgu being used to shoot these bystanders this morning... great reporting CNN!!!! "Once your second ammendment rights have been stripped, you won't be allowed a little pop gun to go squirrel hunting." All of a sudden home invasions are going to be common place, you and the law will simply have to allow it to happen. No matter what this individuals weapon of choice, he had serious issues going on besides "being a disgruntled employee" I'm sure who ever kept him was glad to get him out the door. These days Americans are behaving like Islamic fundamentalists, killing each other out of frustration or sometimes trivial issues. All these Ivy league universities and prestigious learning centres are of no use, if you're citizens go berserk and kill each other for practically no good reason. Not sure if he was gay... may have been... but he definitely WAS another Christian murderer! What is it with all you dangerous unbalanced Christians? Having reading many comments to this tragic situation i must say, thank god there still some sensible human being run around this earth. People banning gun is out. They already out there and say what you want useless topic to debate about it. Seriously i dont think the gun is what one have to be afraid about. Well indirectly they still play a rolled in a killed situation. Have one ever thought seriously we human have to afraid of our self. Yup, we are all built with a serious weapon inside of us. One of many god wonders. Seriously think about it people ,what suddenly make a decent guy or a decent next door neighbor or family or your colleague to one day out in a middle of no where (ok some plan ahead their murder plan) butcher others. Got to be care full of the Dark evil mind lurching inside our brain. But...there still hope human, God is with the one who is with him. Death or alive with God one is never lost. Hate to say this at time tragic happen is god way of reminding human of his creation. And like it or not, to him we will all be return. There was no "rampage". One murderer stalked and killed his former boss. The only rampage occurred when the poorly trained police officers from NYPD wounded nine civilians. More fuel to the democrat bias and Obama loving, CNN doesn't even cover a 19 shooting story in Chicago? Really? The mayor there is a damn joke – and could care less. They were spread wide across the city, not shot en masse...therefore not worthy of national coverage, I suppose. I really do not think this is any way related to who is the POTUS or a bias slant towards him; just the general apathy towards Chicago in general. These things have been happening for *years*, and coverage, other than locally, has always been scarce. Now if 19 people were shot waiting in line to get into the Sears Tower, (and yes, it will *always* be the Sears Tower to me), THEN national coverage may have been warranted...I would hope. And yes, that was me; I did't put the right character in behind my name, lol. Weak President – and this stuff happens!